ZAGG’s 50% Off Cyber Monday Sale Now Live! Black Friday has come and gone, and shoppers have been quite busy. Well, the fun can’t stop yet because Cyber Monday is now upon us. ZAGG once again has their annual 50% off sale, and it starts Monday, November 28th and ends Tuesday, November 29th. 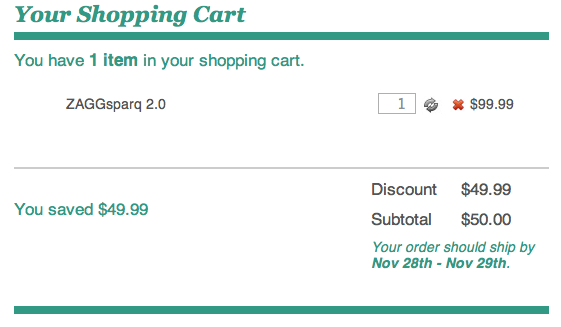 Your discount will be applied during checkout, and other promo codes won’t apply. Also, if you share the promotion on Facebook first, you’ll receive a free ZAGGfoam added to your order. The best deals for this 50% off sale are invisibleSHIELDs, the ZAGGsmartbuds, and the ZAGGsparq charger, which is a great companion for traveling. This is the time to stock up for some Christmas gifts in November. Click here to visit ZAGG.com before quantities run out!